The current weather is Few Clouds 8 °C. Montréal-Trudeau Airport (YUL) has for the first time been awarded a prestigious 4-Star rating under the Skytrax World Airport Star Rating program, joining the ranks of other major world airports. Aéroports de Montréal (ADM) welcomes Transport Minister Marc Garneau’s decision to proceed with the sale of 748 acres of surplus land from the former Mirabel airport reserve and to continue discussions with various Mirabel stakeholders regarding the transfer of future surplus lands for a more industrial use. Airport experience for autistic children There were smiles all around during the 7th edition of the Premium Kids event held at Montréal-Trudeau airport. Effective April 3rd, 2019, the area located immediately after the domestic/international security screening checkpoint at YUL will be divided into two distinct zones: • The international zone (international flights only); • Mixed departures zone (domestic flights and certain international flights). Once again this year, Montréal–Trudeau airport (YUL) has posted excellent results in the various categories of the 2019 edition of the Skytrax World Airport Awards, considered a benchmark of quality in the world airport industry. Icelandic Air carrier WOW Air announced this morning its decision to cease all operations and cancel all flights. Montréal-Trudeau Airport (YUL) has been awarded an honourary plaque for its Pet Squad. This recognition by Humane Society International/Canada (HSI/Canada) highlights initiatives that promote the benefits offered by pets. Aéroports de Montréal (ADM) is disappointed that its passengers are penalized by the decision of taxi drivers to initiate pressure tactics in the conflict with the Government of Quebec. The announced strike will disrupt transportation plans for thousands of travelers coming in or out of the airport. Aéroports de Montréal (ADM) today announced its operating results for the year ended December 31, 2018. Aer Lingus yesterday announced its decision to postpone the launch of its service to Dublin until the summer of 2020 due to aircraft delivery delays. 62 unique interpretations of Montréal enliven the domestic zone After being displayed in Montréal, Taipei and soon in France, the works of the exposition Le Montréaler are landing at Montréal-Trudeau Airport. Highlighting Montréal’s best-known features, the works of 52 illustrators and 10 authors will enhance the tunnel space leading to the terminal’s domestic zone. A new record: 19 million passengers welcomed at Montréal-Trudeau in 2018! On December 19, and for the first time in its history, Montréal-Trudeau airport welcomed its 19 millionth passenger in the same year. In a contest organized and shared through social media, Ms. Evelyne Bussière was selected as the 19 millionth passenger to enter the airport terminal in 2018. Montréal-Trudeau Airport is expected to welcome some 55,000 travellers a day during the holiday period, which will undoubtedly be the busiest in its history. Aéroports de Montréal (ADM) would like to take this opportunity to provide passengers with some advice for making their visit to Montréal-Trudeau more enjoyable. As the busy holiday season approaches, Aéroports de Montréal (ADM) would like to remind you that you can leave your car worry-free under the watch of the Montréal-Trudeau Airport parking team. YUL Pet Squad: Canine animation takes off at Montréal-Trudeau! Passengers at Montréal-Trudeau have been enjoying a new entertaining and soothing experience at the airport since the beginning of October. A squad composed of 30 dogs has been formed by Aéroports de Montréal (ADM) to roam around the terminal, offering moments of companionship to travellers. The winter season that is just taking off at Montréal-Trudeau airport will once again be marked by strong growth, both in terms of passenger traffic and air service. Aéroports de Montréal (ADM) today announced its financial results as of September 30, 2018 showing continued strong growth in passenger traffic of 6.9% and a significant increase in EBITDA (earnings before interest, taxes, depreciation and amortization). Aéroports de Montréal (ADM) notes with great satisfaction the efficient and prompt passage of an increasing number of travellers at Montréal-Trudeau’s Canadian border control during the 2018 summer season (July and August). Aéroports de Montréal (ADM) reminds you that the Montréal-Trudeau terminal is in a smoke-free environment. Cannabis use is also not permitted anywhere on the airport site. Aéroports de Montréal has launched a call for tenders to select a construction manager for the implementation of its Cityside development program. Aéroports de Montréal (ADM) is proudly celebrating the addition of a 150th destination from Montréal: Vienna, the capital of Austria. Air carrier Primera Air yesterday announced its decision to cease all operations after 14 years of activity. Foliot Furniture is proud to announce the start of construction on its new plant at the Mirabel aeronautic and industrial park. With passenger traffic on the rise and an increasing number of popular destinations on offer, a large number of travellers will be passing through Montréal-Trudeau to fly to one of 148 destinations. Exceptional day at YUL for children with autism spectrum disorders! Exceptional day at YUL for children with autism spectrum disorders! Everyone was in high spirits this afternoon at the end of the 6th edition of the Premium Kids event held at Montréal-Trudeau airport! Aéroports de Montréal announces its results for fiscal 2017 Aéroports de Montréal (ADM) today announced very positive results for the fiscal year ended December 31, 2017, with a record 18.2 million passengers welcomed at Montréal-Trudeau and a 10.9% increase in EBITDA (earnings before interest, taxes, depreciation and amortization) compared with 2016. Montréal-Trudeau airport wishes you an enjoyable spring break! With rising passenger traffic and a particularly harsh winter, many travellers are expected to visit Montréal-Trudeau Airport during spring break to fly to sunnier destinations. Montréal-Trudeau makes major investment to improve its snow removal and de-icing capacity With an average annual snowfall of 220 cm at Montréal-Trudeau airport, and 13 episodes of freezing rain over the past year, Aéroports de Montréal (ADM) has invested more than $6 million to prepare for the 2018 winter season. Expansion of the ATA: Good news for air transport Aéroports de Montréal wishes to note that an agreement has been reached between the Hon. Marc Garneau, Canada’s Minister of Transport, and his Israeli counterpart, Yisrael Katz, which expands the air transport agreement between Canada and Israel. Tips for travellers during the holiday period Montréal-Trudeau Airport will welcome many travellers during the holiday period. Surprise concert by Cœur de pirate at Montréal-Trudeau! Surprise concert by Cœur de pirate at Montréal-Trudeau! To lighten the November gloom, Aéroports de Montréal (ADM) last night gave passengers a big surprise: a free and intimate concert by singer-songwriter Coeur de pirate. For almost an hour, the Montréal artist tickled the ivories of a grand piano at Montréal-Trudeau’s international jetty in front of hundreds of travelers, all of whom seemed thrilled to witness her performance! Antigua, Lima, Santo Domingo and Phoenix: Four new destinations offered this winter out of Montréal-Trudeau Just as Aéroports de Montréal (ADM) has recently announced excellent results for its third quarter, both financially and in terms of passenger traffic growth, it has confirmed several new air services offered this winter out of Montréal–Pierre Elliott Trudeau International Airport, in addition to the many destinations already available to travellers.s. 365 taxicabs say "Bonjour" at Montréal-Trudeau Aéroports de Montréal (ADM), the Bureau du taxi de Montréal, Tourisme Montréal and the City of Montréal today welcomed the entry into service of 365 new taxi vehicles bearing the “BONJOUR” logo at Montréal–Trudeau airport. Aéroports de Montréal announces its results as at September 30, 2017 Aéroports de Montréal (ADM) today announced its consolidated operating results for the three- and nine-month periods ended September 30, 2017. Border Control at Montréal-Trudeau - Positive results for the summer of 2017 Aéroports de Montréal (ADM) are pleased to report that measures implemented this summer to enhance passenger border clearance processes at Montréal-Trudeau Airport have generated positive results. Air Canada Introduces Montreal–Tokyo Non-stop Flights First scheduled service between Montreal and Japan Air Canada announced today the introduction of a new service between Montreal and Tokyo Narita starting June 1, 2018. Flights will operate year-round, with daily service during summer peak travel and three times a week during the winter, with Air Canada’s flagship aircraft, the Boeing 787 Dreamliner. 350 taxis at Montréal-Trudeau greet passengers with "Bonjour" Aéroports de Montréal (ADM) held a random draw today for 350 taxi permits to serve Montréal–Trudeau airport. Aéroports de Montréal announces its results as at June 30, 2017 Aéroports de Montréal (ADM) today announced its consolidated operating results for the three- and six-month periods ended June 30, 2017. These results are accompanied by data on passenger traffic at Montréal–Trudeau International Airport. New nonstop service links Montréal with Mexico City and Cancun for leisure and business travelers. Interjet and Aéroports de Montréal celebrated Interjet’s first flights between Mexico and Canada today, with nonstop service between Montréal – Pierre-Elliott-Trudeau International Airport and Mexico City’s Aeropuerto Internacional Benito Juárez as well as between Montréal and Cancun International Airport. As the summer season begins, Aéroports de Montréal (ADM) and the Canada Border Services Agency (CBSA) are unveiling a series of measures to improve border crossings at the airport. Aéroports de Montréal wishes you happy travels! Here are some tips to help you get the most from your vacation. Today, as part of the public event highlighting the involvement of several new partners in the L’économie sociale, j’achète! initiative of the Conseil d’économie sociale de l’Île de Montréal (CESIM), Aéroports de Montréal (ADM) signed the statement of undertaking and confirmed its commitment to using more services from social economy enterprises. Aéroports de Montréal (ADM) took the opportunity provided by its annual general meeting to unveil a portion of its capital investment program. Aéroports de Montréal (ADM) today announced its considated operating results for the first quarter of 2017. These results are accompanied by data on passenger traffic at Montréal International Airport. Aéroports de Montréal, which held ists annual general meeting tomorrow, celebrates the addition of new direct destinations departing from Montréal-Trudeau International Airport, namely Lima in Peru, announced by Air Canada this morning, bringing Montréal-Trudeau's direct destinations to some 140 annual or seasonal flights. Aéroports de Montréal (ADM) announced today that it has issued a new series of revenue bonds to raise total capital of $250 million. Aéroports de Montréal is proud to be associated with the 375,000 Trees program..
On the eve of Earth Day 2017, Aéroports de Montréal (ADM) has launched an exhibition on celebrated botanist Francis Hallé at Montréal-Trudeau airport and announced a partnership with Jour de la Terre for the 375,000 Trees planting program developed as part of the celebration marking Montréal's 375th anniversary. André Schneider and Philippe Rainville, the recently appointed heads of Genève Aéroport and Aéroports de Montréal, signed a cooperative agreement today that will add a new dimension to the collaboration between the two airports. Montréal-Trudeau is proud to support its hockey team: Since Saturday the “Montréal” on the terminal’s facade has been draped in the team’s colours, the Canadiens de Montréal, announcing that the playoffs have started! Award-winning bistro offers travellers a convenient gourmet dining experience. A group of children accompanied by their families experienced a special day at Montréal–Trudeau airport today during the fifth edition of the Premium Kids program, which organizes airport-process familiarization days for children with autism spectrum disorders (ASDs) or functional limitations. Aéroports de Montréal (ADM) wishes to clarify its existing measures to ensure public safety and security at Montréal–Trudeau airport. Aéroports de Montréal is pleased to be a featured partner of Art Public Montréal’s web site and to draw attention to several original works of art incorporated into the architecture of Montréal-Trudeau airport. Aéroports de Montréal (ADM) today announced its audited consolidated operating results for the fiscal year ended December 31, 2016. Today marks the launch of Air Canada’s daily year-round flights from Montreal to Shanghai, China, the airline’s first direct service to Asia from Montreal, offering convenient one-stop access to points throughout Quebec, Atlantic Canada and the United States. WestJet today announced a significant investment in Quebec's travel and tourism market with increased service and new routes to and from Montréal–Pierre Elliott Trudeau International Airport as well as Quebec City's Jean Lesage International Airport. Aéroports de Montréal (ADM) is pleased to announce that Montréal–Pierre-Elliott-Trudeau International Airport welcomed a total of 16.6 million passengers in 2016, an increase of 1.1 million, or 6.9%, over 2015. Air Transat is proud to announce that it will be offering direct flights from Montreal to Tel Aviv. Also available from Toronto with a connection in Montreal, this non-stop flight between the Montréal–Trudeau airport and the David Ben-Gourion international airport of Tel Aviv will operate twice weekly, on Wednesdays and Sundays, from June 18 until late October. To meet Transport Canada requirements for construction of a security checkpoints for non-passenger screening vehicles (NPSV), ADM has begun the work in Lot 7. Aéroports de Montréal is a private, not-for-profit and financially independent corporation responsible for the management, operation and development of Montréal–Trudeau and Montréal–Mirabel international airports. Aéroports de Montréal is a responsible employer, offering attractive career options in a one-of-a-kind work setting. 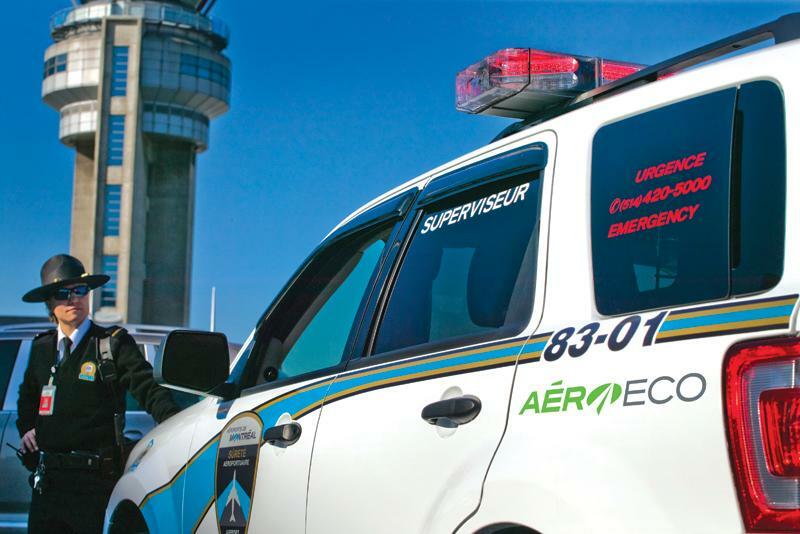 Aéroports de Montréal works closely with various law-enforcement bodies to ensure the safety and security of the public, airport facilities and aircraft. In addition to providing airport services consistent with the needs of the community, the mission of Aéroports de Montréal is to foster the economic development of Greater Montréal and coexist in harmony with the surrounding environment. The media and the public have access to a wealth of information on Aéroports de Montréal and its activities.